This month really zoomed by. I didn’t get much reading done at all, and it’s mostly because Ruby’s nap times have been on the go a lot, and her bedtime has been pushed way back by circumstance. Both of these things have left me with much less time to read. The Life Changing Magic of Tidying Up may be the most influential book that I will read all year. I’m still working (so, so slowly) on implementing the ideas from the book into our living space, and really into my life in general. For example, I enjoy a lot of podcasts, but not all the episodes of a particular podcast are really worth my time. So, the ones that I’m meh on, I skip them. This, then, frees up more of my time for things I genuinely am interested in. I hope that by the end of the year, my house will be in much better shape, but I’m trying to not be too hard on myself for being unrealistic in what I can accomplish. Then, both at the same time, Insurgent and Allegiant from the Divergent series came available from the library, and so I downloaded both of them. In order to keep them from disappearing from my Kindle after my 2 week lending period ended, I’ve turned the wifi off on it. They won’t disappear until I’ve synced it, but that means nothing new can be added until I’ve finished them. I finally got through Insurgent midway through the month, and I’m getting close to finished with Allegiant. Of course, the conundrum that I’m having is that – does it really count as a trilogy because the author keeps adding stories from the same universe and using the same characters and publishing them. GAH. I’ve decided since the series is technically stand alone, and the rest are “short stories” or addendums, that it counts. But come on, stop adding onto trilogies, people. As far as upcoming books go, I’ve got To Kill A Mockingbird coming up next for my book club read, and then I checked out Eleanor and Park by Rainbow Rowell from the library. 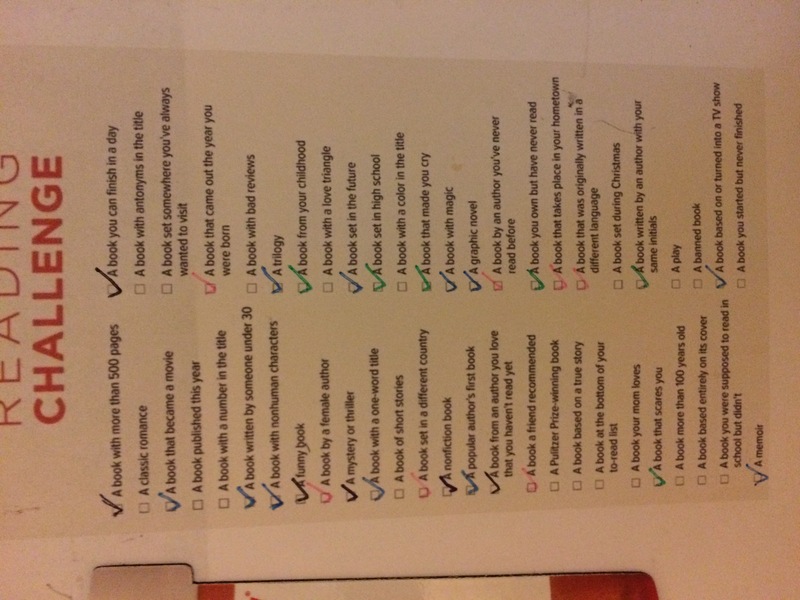 I read two books this month, and only checked off one measly box. So, 19 books read and 29 boxes checked. I’m still on track if I keep up with my average pace. The image is technically wrong because I finished Allegiant on July 1st, so it doesn’t count for my June totals.